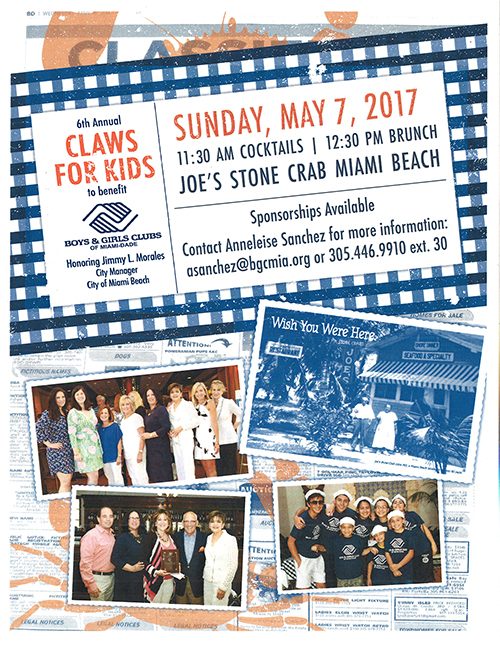 Boys & Girls Clubs of Miami-Dade’s 6th Annual “Claws for Kids” fundraising brunch will be held on Sunday, May 7, 2016 at Joe’s Stone Crab in Miami Beach. 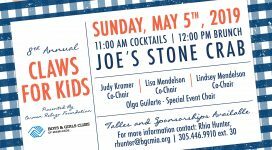 Cocktails will begin at 11:30 a.m. with brunch to start at 12:30 p.m. For sponsorship information, please contact Anneleise Sanchez at (305) 446-9910 ext. 30, or via email at asanchez@bgcmia.org. To donate a raffle item, click here.